Weighing 13 lbs 14 ounces. I had the big fish from a Lake Ellesmere tributary mounted. Through working late I had to rely on Neil Bond for that early morning drive down to the Rangi just as the sun was rising, with the hope of catching an early salmon. As luck would have it, Neil landed a very silver salmon of 25lb on his third cast. With all the salmon rivers dirty, due to the north-west winds, I decided to look elsewhere to fish. My mind was made up for me when Graham Isles rang after arriving home from Australia for a short holiday. He asked if I was keen for a trout fish. I was, as I had promised Shaun and Andrew, the chefs at the Ferrymead Tavern (sadly destroyed in the 2011 and 2012 Christchurch earthquakes), a trout for their barbie. I picked Graham up and headed south towards one of our favourite rivers, thinking to myself that it would be a nice change fishing in the coolness of the night to bashing the surf in the heat of the mid-morning sun. There was just enough light left as we threaded the fly line through the guides and slowly fished our way towards the mouth. Graham had taken two rods with him, his fly rod and a spinning rod. Which was rigged up with a lead weight and a fly, in the hope that he could catch a trout which his father could use. A very light tug indicated my fly was taken and I immediately lifted my rod to set the hook, which resulted in a complete miss. Graham walked past me saying, “See you down at the mouth.” I was hoping that when I finally got down there that he wouldn’t be standing where I would like to fish. When I finally arrived Graham had walked right past my favourite spot. I heard the bait arm click over as I stripped line off my reel in preparation for a cast. With the cast completed, I called out, “Anything?” “Nope, a couple of takes” was the reply. I felt no tug, just a change in pressure on the line and immediately struck. The fish jumped once in an attempt to throw the hook, then stayed deep and took off upstream at great rate of knots. It tore the slackline from my hand and soon was on the reel. With the line cutting through the water and quite audible I knew then that I was onto a big fish. I lowered my rod to apply side strain to turn the fish before he made it to the safety of a tree that had grown over the river. With the fish turned and somewhere in front of me out wide, I turned my light on in the hope of getting a glimpse of how big the fish really was. I knew then that I was going to need a hand with it as l only managed to get half of the fish into my landing net and was unable to lift it. Gratefully accepting Graham’s offer to land the fish, he quietly slipped into the river. With one hand on the net and the other firmly around its tail, in one movement he lifted the fish and threw it up onto the bank. It was absolutely awesome, within twenty minutes of fishing a beautiful resident trout lay at my feet. Later back at the car it pulled my scales to over the magic 10lb mark, to almost 14lb. Graham quickly switched back to fly fishing and soon was into a fish. I called out “How big?” From somewhere out of the darkness I heard the reply, “It’s a herring.” I knew that the lake had been opened to the sea and I had caught herrings or rather yellow-eyed mullet in the river. It wasn’t till later that I found out that his ‘herring’ was, in fact, a 5 1/2lb sea-run trout which was dwarfed by my fish. I continued to fish on, only to lose another fish after it erupted on the surface. I was getting take after take but nothing would hook up. My suspicions were confirmed when I checked my lures. Somehow the hook had broken off way up in the body of my fly. 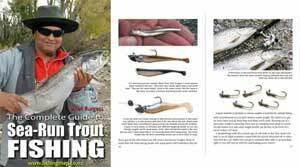 (Two days later Graham caught a trout weighing 9 1/2lb and presented me with the other half of the hook which had been firmly embedded in its mouth). Incredibly well-conditioned trout from my favourite river. My second fish was ridiculously easy to catch. It was occasionally rising and always in the same spot. Casting slightly above the fish and letting the lure swim through its lie, l was rewarded with a violent take. This fish tried to throw the hook with a series of jumps. the complete opposite of the first fish. A very deep silver trout of 9lb soon joined the first. For the fish to have been in the condition they were this night, there must have been heaps of food available to them. We ended the night after I landed my fourth fish, keeping my promise to Shaun and Andrew – fish each for their barbie. My 14lb fish was placed onto a board and was quickly frozen, to be mounted at a later date. In all of my 20 plus years of trout fishing, I have caught some big trout, but the really big fish had eluded me until now. 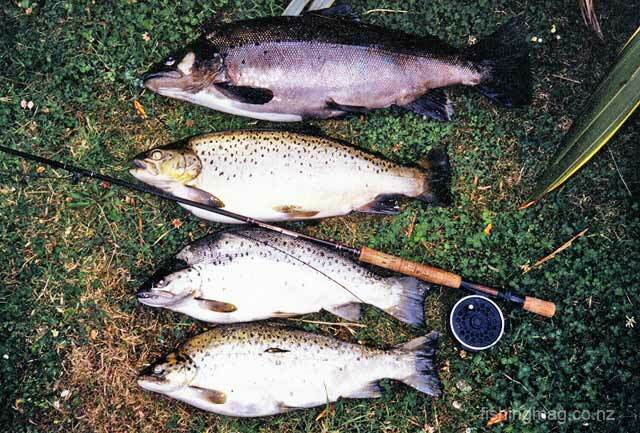 Twelve years ago I caught a trout that was 9lb 15oz, just short of the magic ten-pound mark. Still, I had it mounted but unfortunately, it didn’t stand the test of time as its head had shrunk. For a whole week, the fish became the talking point of the Ferrymead Tavern’s patrons, fascinated by the sheer size of the fish. For now, the location will remain our secret, because somewhere on this stretch of river there might be one even bigger. And as for the fly, it was one of my own creations. It could be best described as a cross between two lure patterns, a Hairy Dog and a Mrs Simpson, with an orange body. New Zealand fishing flies. My next recipe is a trout recipe, in which I have combined the sweetness of oranges and honey with the pungent spicy aroma of fresh ginger. This gives the almond covered fillets of trout a sensational taste and yet it still allows the full flavour of the fish to come through. 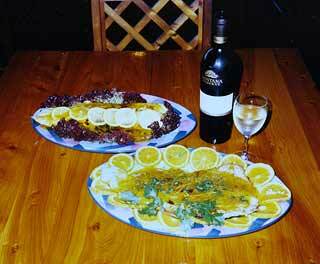 Top dish: Almond trout with tangy lemon sauce. Front: Almond Trout with an Orange, Honey and Ginger Sauce. Almond flakes, enough to cover the fillets. 2 cups fresh orange juice. 10 slices of fresh green ginger. 6 sprigs of fresh coriander. Clean and fillet the fish. leaving the skin on. Take care to remove all the fine bones. Coat the fillets with potato starch, flesh side only. Brush the coated flesh with beaten egg and coat with almond flakes. Press on. Heat the wok until hot. Add a little oil and 1/2 teaspoon of salt. Reduce heat and cook the fillets slowly. Take care as too much heat will burn the almonds. The trick here is to cook the skin side of the trout longer. When cooked, drain and place onto a garnished plate. Stack the slices of ginger and cut into fine shreds. Cut the peel from one orange, scrape away any of the white pith and cut into very fine strips. (The quickest method is to use a citrus zester). Chop three sprigs of coriander, which are to be added last as a garnish. It is also known as Chinese parsley and has a distinctive strong aromatic and spicy flavour. Place all the sauce ingredients into a clean wok, bring to the boil and thicken with a little potato starch mixed with a little water. Pour over the trout. Garnish with slices of orange, chopped coriander and sprigs of coriander and serve. 1/2 cup fresh lemon juice. 1 teaspoon yellow food colouring. 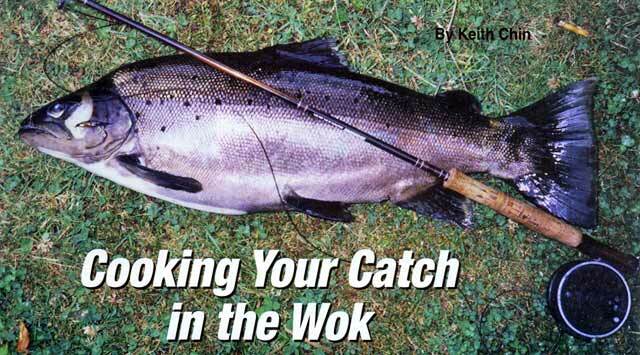 Until next time, keep your line wet and your wok hot!